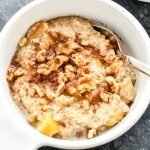 Instant Pot Cinnamon Apple Steel Cut Oats is a one-pot, hands-off method you need to take your steel cut oats up a notch! Lightly sweetened with perfectly sautéed honeycrisp apples and excellent to make ahead and eat for breakfast throughout the week. Hit the Sauté button your Instant Pot and make sure it’s set to High. Add coconut oil. When the oil is melted and the display reads Hot, add cut apples to the IP. Use a high heat spatula to stir the apples until they’re fully coated in coconut oil, and then add honey and cinnamon. Continue to cook for 4-5 minutes stirring frequently, or until the apples are tender to your liking and your house smells like apple pie. Hit the Cancel button on the IP to turn off the heat. Carefully remove apples from the IP so only the flavored coconut oil remains in the insert. Add oatmeal, almond milk, water and salt to the IP. Place the IP lid on, and make sure the steam release valve is sealed. Set the IP to Manual or Pressure Cook (new models) for 4 minutes. When it’s done pressure cooking, let the steam naturally release for 10 minutes. The oatmeal will continue to cook during this time. Hit the quick release. After the float valve has gone down, remove the lid and very carefully stir to fully combine liquid and oatmeal. It will continue to thicken as it cools. When the oatmeal looks more like oatmeal, toss in the previously cooked apples and stir until combined. Serve immediately with desired toppings, or refrigerate for up to 4 days in a sealed container. To reheat, add a couple tablespoons of water or milk of choice and stir to loosen up the oatmeal. This oatmeal tastes just as good reheated! It’s great to make ahead so breakfast is ready to go during the week. Base oatmeal recipe adapted from both How to Make Steel Cut Oats from Bob’s Red Mill and Instant Pot Steel Cut Oatmeal from Life Made Sweeter. Nutrition information estimated with My Fitness Pal (no toppings included). I have only tested this recipe with a 6-quarter Duo Instant Pot, and the recipe may not work with other Instant Pot sizes. Please keep in mind that due to the nature of pressure cooking there may be inconsistencies from small variations in ingredients or altitude. Try it and see what works best for you!